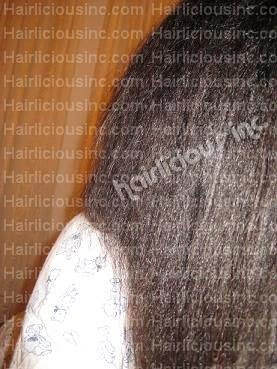 Hair Update - Hairlicious Inc. Still haven't dusted my ends like I said I was..haha..I'm such a chicken!! Kinda shedding (nothing too serious), I think my iron is low @ the moment. I ♥ Hot Six Oil as a sealent after I moisturize plus it has my beloved Safflower Oil in it too. So looking forward to your next hair update! I use Aphogee moisturizing shampoo...you should try that brand in general for shampoo (& the moisturizing type specifically). I'm new to your blog and hair care in general but I'm learning and your blog is doing a huge deal of teaching. I wanted to ask what are some good sealers? I'm currently using KeraCare Oil Moistuizer. What do you suggest? @ Belle - Thanks! I can't wait either! @ Bar07 - thanks for the tip, I'll look into it. But for now, those 2 shampoo's are my choices. Hey Sunshyn, I recently came across your blog.. love it - I don't need long hair because I have long hair used to be bra strap lenght - now its about the lenght of yours. My problem is thinning and brakeage. I have the type 3a,b,c.. type hair.. after reading your bog I started my own regimen.. that was Sunday - I only DC and tried some of the products you recommended - wasn't happy with my hair on Sunday it felt rough and course and not to mention the handful of hair that came out - but today it is smooth and full of mositure.. once I get my blog site up I will keep track of the progress and pictures.. thanks. @ Socasassy - Im sorry that your hair didn't turn out the way you wanted it too. Please remember that the products I use work well for my hair type and texture. It may or may not work the same way for you since your hair has a looser curl. Please keep me updated on how your hair turns out and I would love to visit your blog.